Hey Everyone! 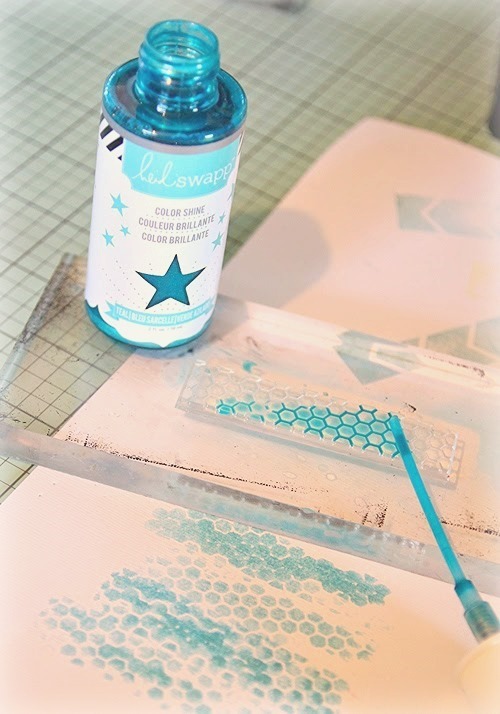 Mandy Koeppen here with you today sharing a few tips, tricks, and ideas with you when creating with those awesome Elle’s Studio Washi Tape Stamps included in our June 2014 Stamp Kit. I’ll share examples below along with a layout & card created with our June Hip Kits using several of the techniques that I share with you below. Let’s get started. MIST: this is a really different technique to try with your stamps. TIP- use the mister nozzle to spread the excess mist onto the stamp then start stamping. This is a fun way to get 2 different effects, you can see that you get a denser image the first time and a more crisp image the second time. DISTRESS INK ON VELLUM: I love vellum it’s no secret so I had to give it a try and the distress ink found in the June Color Add-on is PERFECT as long as you have a little patience and let the ink dry before adding it to your project. TIP- I tried chalk ink and StazOn but wasn’t happy with either. HEAT EMBOSSING ON CARDSTOCK: The stamps are great for creating embossed washi images! I chose the honeycomb in yellow and it was awesome! I tore the ends as you’ll see in photos below so that it looks just like it was for off the roll just like tape. Simple and easy. CREATING A BACKGROUND: For the background I went with a full tag but these clear stamps are easy enough to line up you could create a photo mat, a layout background, whatever you choose. I went with the Picked Raspberry Distress Ink from our June Color Add-on because it’s so pretty and dries quickly. Here is a look at all of the different examples that I created. Not pictured above are the Yellow polka dot paint on cardstock and the 2 blue painted patterns on vellum on the right. The only tip I can give with the paint is you’ll need patience because it does take a bit longer to dry. I’m sure there are lots of other ideas y’all can come up with like using water colors, creating a ombre affect, gelatos, etc. The stamps can be used in so many ways, just have fun with it! My Avery Girl layout was inspired by these photos of Avery snapping shots of early spring and the colors in the June kits. I love the Elle’s Studio pattern paper with all the words on it, they’re summer words but where I cut them they work for what was going on in the photos and I really love that. American Crafts has finally won this non-glitter fan over with these not so glittery glitter letters that are included in our June Embellishment Add-On Kit. Does that sentence even make sense? Probably not. The glitter isn’t that fall off stuff and I love it. Here you can see I’ve used 2 of my examples I created with the Elle’s Studio Washi Tape Stamps (the arrows on vellum & yellow honeycomb). I layered real washi tape in there too. I have to be honest there really is no rhyme or reason or inspiration behind this card it was just using the examples I created earlier and making colors work together. It worked out pretty well. Here you can see a detail shot where I used the Elle’s Studio stamps with Mist & Distress Ink.